What schools did you consider for after Hesston? Or did you always know you were going to KU? The University of Kansas was my main pursuit as I neared the end of my time at Hesston. At Hesston, I earned my associate degree in nursing (ADN) and secured my Registered Nursing licensure following graduation. I didn’t necessarily have to continue on to get my bachelor’s degree in nursing (BSN) right away or at all. I also considered Tabor College’s (Hillsboro, Kan.) RN to BSN program. The articulation agreement Hesston has with KU’s RN to BSN program made the transfer extremely easy and painless for me. Hesston provided me with the fundamentals and core nursing knowledge I needed to be a successful nurse. My time at KU has simply been an addition to that foundation and I have expanded my role as a leader, researcher and educator. I hold close the holistic and spiritual values that the Hesston nursing program instills as this is something that is hard to develop in online courses. My favorite part about my Hesston Experience is the relationships I built with the nursing instructors. The support and mentoring I received from each of them I account to a huge part of my success in school and in my work. What are your favorite parts of your KU experience? I like the challenge of the courses and I notice what I am learning already making an impact in my work as an RN at Newton (Kan.) Medical Center. I am pleased with the route I took towards earning my bachelor’s degree. I enjoy being immersed in work and an education at the same time. They feed off of each other and I can apply what I learn in the classroom to work and vice versa. What do you plan to do after finishing your bachelor’s degree? After completing my bachelor’s degree I do not plan on continuing my education any further. I hope to stay working at Newton Medical Center on the floor or obtain a leadership role of some sort. 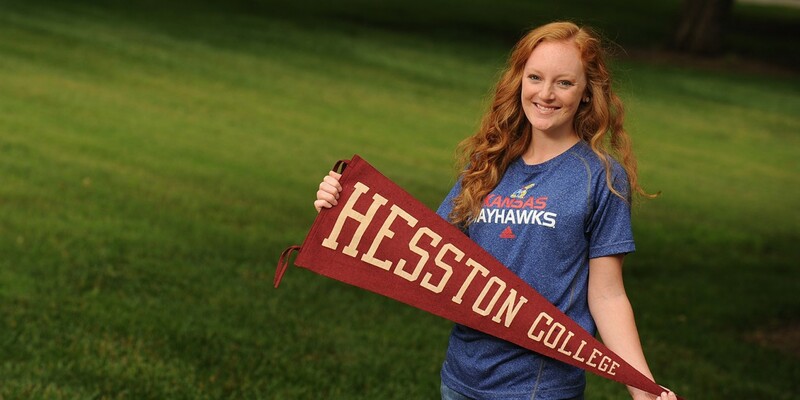 What would you tell high school students considering starting at Hesston and transferring to KU or any state school? To nursing students particularly, I would highly recommend starting with Hesston College’s nursing program – even for those looking to go beyond a two- or four-year degree. Of all the options for nursing schools and programs, I would not have done it any differently. Hesston’s program has one of the highest pass rates in the state due to the outstanding instruction. The program is well-known and well-respected by potential employers.